The professional aluminum circle for cookware factory introduce advanced aluminum circle production equipment, effectively improve production efficiency and material utilization, and shorten the delivery time. Aluminum circle factory strengthen the control of the grain size and elongation of the aluminum coil in the early stage, and produced aluminum circles DC and CC respectively, and cover the 1000, 3000, 5000, and 8000 series alloys. The aluminum disc has good formability, candle resistance, fatigue strength and moderate static strength. As used for further process into aluminum cook utensils like pan, pot, pressure, the surface of the aluminum circle for cookware is required to be smooth and scratch-free, clean and oil-free, and the edges are smooth and burr-free. Aluminum circle for cookware has excellent deep drawing and spinning performance. The main technical parameters of the aluminum circles are: thickness of 0.5-6mm and diameter of 100-950mm. 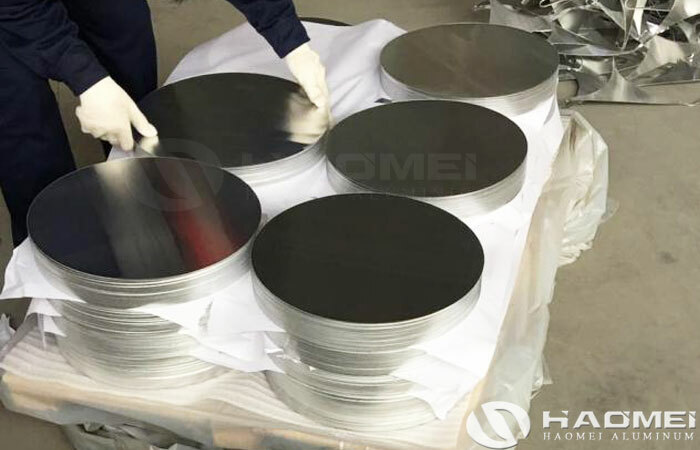 The aluminum circle discs has an elongation of 30%-35% and a grain size of one grade, and comply with RoHS and REACH environmental standards. The technicians of the aluminum circle for cookware factory have rich experience, sum up the experience from the customers in the past, strictly control the production process, and strive for perfection of products, effectively avoiding the problems caused by deep drawing or spinning in the later processing of customers.